Mallet finger is a common athletic injury. Basketball and baseball players routinely experience jammed fingers, but the injury can occur because of a crushing accident on the job, or even because of a cut finger while working in the kitchen. Any rapid motion that jams the tip of a finger against an object can cause a mallet finger. This most commonly occurs at the index or middle fingers. The tendon is damaged, but no fractures (bone cracks or breaks) are present. The tendon ruptures with a small fracture caused by the force of the injury. The tendon ruptures with a large fracture. People with mallet finger may delay seeking medical attention, even though they may be in a great deal of pain, simply because they can still use their hand. Contact doctor immediately to evaluate the injury to determine the need for X-ray films, and to repair any deep cuts. The doctor may recommend an appointment with a hand surgeon for further evaluation, splinting, or surgery. A doctor may instruct a person with mallet finger to go to a hospital's emergency department for further evaluation. X-ray films assist the doctor in determining if the bone is cracked or broken. Imaging studies may also assist the doctor to explore foreign debris in the cut (laceration). Treatment depends on the severity of the injury. First aid at home includes icing the finger and cleaning and dressing any cuts that may be present. More serious injuries may require stitches or surgery. Apply ice to the injured finger joint to reduce swelling and tenderness. Wrap ice in a towel; do not apply ice directly to skin. A bag of frozen vegetables wrapped in a towel conforms nicely to the hand. Take care not to injure the finger even more. If a cut is also present, clean the cut under running water for a few minutes, then wrap the finger with clean gauze or a cloth. Apply a moderate amount of pressure to help stop any bleeding. If the finger is not broken or cut, or if only a small fracture is present, the doctor will apply a splint to the end of the finger so it remains in the extended position. With a splint, the outermost joint on the injured finger is not bendable, but the rest of the finger is bendable. This splint needs to be worn for at least 6 weeks, perhaps longer, to ensure that the tendon is given the best chance of healing. The doctor will repair any cuts or damage to the skin. And, if necessary, the tendon may be stitched (sutured) to repair it. For pain relief, apply ice to the joint. A variety of over-the-counter and prescription pain relievers may be prescribed depending on the health of the patient, and if any pre-existing medical conditions are present. When the fracture is large and causes joint damage, the decision may be made to operate on the finger for the best results. A hand specialist or orthopedic surgeon performs this surgery. The treating surgeon will monitor the progress of the injury, especially if a deformity in the finger develops. If a cut is repaired, a follow-up visit to the doctor will be necessary in approximately 10 days to have the sutures removed and to determine if a deformity of the finger is present. To prevent mallet finger injuries, use caution when participating in activities, including athletic events. To prevent injuries from happening again to the same finger, leave the splint on for the entire time the doctor has recommended. Results of treatment of mallet finger injuries vary. Most people regain full function of the finger with no long-term effects. 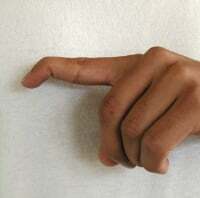 Some people will develop a long-term deformity known as a swan neck, which involves the all of the finger joints. This may require additional surgical correction. For minor mallet finger injuries, splinting and surgery have been shown to have the same results. This person's index finger has been injured, producing a condition called mallet finger. Click to view larger image. Meals, RA, MD, et al. Mallet Finger. Medscape. Updated: Aug 27, 2017. What was the cause of your mallet finger?